Thousands of older people are being left to struggle with everyday tasks such as getting dressed and taking medication, research from Age UK has revealed. According to the research, a total of 870,000 people aged 65 to 89 have social care needs that are not being fulfilled. These include being left without the aid of care workers or family and friends to carry out such tasks as getting out of bed, cleaning, using the toilet and eating. Almost a third (31.1%) of people who have difficulty with these daily activities are not receiving crucial help, Age UK says. A breakdown of the figures shows four in five need help taking their medication (200,000 out of 240,000); more than two-thirds find it difficult to eat on their own (160,000 out of 250,000); more than two-fifths find it hard to get dressed (590,000 out of 1,300,000m); and one in three find it hard to get out of bed (190,000 out of 570,000). Caroline Abrahams, charity director at Age UK, says the figures "beggar belief" and points out the research only analyses cases up to the age of 89. 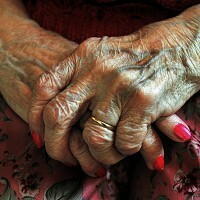 "It makes you wonder how many more thousands of people in their nineties are being left to struggle alone", she says. It also acts as a timely reminder of the benefits of a holiday with family, which can offer a much needed break from daily routines and a period of support from those they know best. Insurance for pre-existing medical conditions or over-65s travel insurance can help to make a trip away hassle and worry-free, allowing all generations to enjoy some quality time together. The research also uncovered that between 2005/06 and 2012/13, the number of over-65s benefiting from the services of social care has fallen from 1,231,000 to 896,000 - or a drop of 27.2 %. This is despite this age group increasing by more than one million over the same period. And the bill for social care services for older people across the UK has dropped 15.4% - or by a massive £1.2 billion. This is putting local authorities under huge pressure and means access to publicly funded social care is only available to those deemed to be in 'substantial' or 'critical' need. Those categorised as 'moderate' - such as those who need basic help with daily tasks - are being left without any help, the charity warns.